Celebrating 35 years of Business! A fabric consisting of alternating left and right hand spirals, which are joined together with the insertion of a crimp rod. The belts are used to secure an absolute straight drive, provide additional strength, and obtain positive speed control. A fabric consisting of precision Balanced Weave belting used to carry light to medium loads. Positive Drive Pin Rolls and Sprockets are precisely machined drive components that are circumferentially surfaced with rows of teeth. Welcome to Penn Wire Products Corp.
Penn Wire Products Corporation (PWP) is located in Lancaster County, Pennsylvania. 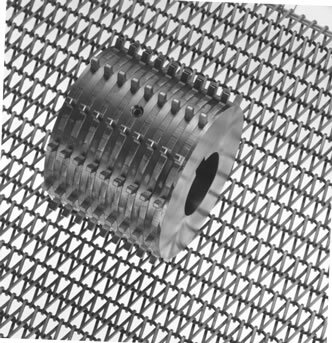 PWP was started in 1983 by an engineer with over 40 years experience in the woven wire conveyer belt industry. For more than 35 years, PWP has grown and now has two manufacturing facilities in Lancaster County.